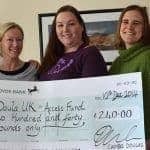 The ‘Find a doula’ service aims to provide expecting parents with information about doulas working in their area. The ‘Find a Doula’ listing may not be used for any other purpose such as advertising or cold calling. You may not create a link to this website from another website or document without Doula UK CIC’s prior written consent.